We have all reasons to repeat that the line of Samsung mobile handsets, despite its mainly fashionable character, is probably the most rational and well-calculated among the phone series of all manufacturers in this field. There is usually no criticism about the feature combinations in Samsung phones, as this company offers only those features that are in high demand in one or another segment. However, it turned out that this pragmatic manufacturer also experiments with niche products. At least, the SGH-E630 makes you feel that. It's quite obvious that this model is Samsung's attempt to create one of the most compact sliders on the market. As a result, this new phone, being a model of Samsung style, still has noticeable differences in design. 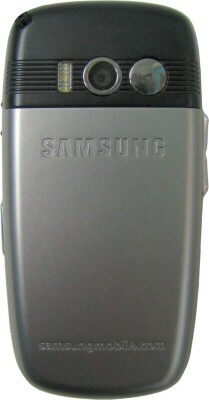 Samsung SGH-E630 is a phone of the slider form factor, it's remarkable for small dimensions and weight. It's a leader among Samsung sliders by these parameters. The closest well-known counterpart for E630 is Siemens SL55. The german competitor is formally smaller, but the models are subjectively of the same dimensions. E630 design resembles that of D500. Geometric solution of the new model also features more pronounced edges and corners, which help to keep the model within the unisex style and don't allow it to become too feminine, as the small slider attracts women "by default". The phone looks very nice, it's small but well-knit, assembled tightly, with very thin gaps between its components. The case is certainly made of high quality plastic, rather hard to avoid creaks, deformations, and backlashes. Finishing is also up to the mark. The E630, like the other latest Samsung models, actively uses glossy black. Details with different finishing and texture brighten up the design, save it from becoming boring, and at the same time are in perfect harmony with each other. Now concerning the price of compact dimensions. Designers cut the automatic opening mechanism from this slider, which would have allowed to open a phone with one hand. Moreover, the mechanism is made very tight in order to reduce the gap between the base block and the slider (it was a tad less than a millimeter in phones with automatic opening mechanisms) and eliminate backlashes. It's very difficult to open the phone with one hand and it's almost impossible to close it, in all cases you have to use both hands. If you try to open the slider with one hand, you may accidentally press the buttons, which appear right under your fingers. There is a thumb rest under the display, familiar by previous Samsung sliders. It's made of plastic here instead of rubber, as it's designed for increased stresses, but still you cannot engage it to close the phone with one hand. Then, mechanical trajectory of the slider is not linear, but a little curved. When open completely, it's a tad inwardly inclined (the phone has a slightly concave surface), which contributes to the tightness of the mechanism. So, you should resign yourselves right away that you will have to use both hands to open and close this phone. To reduce the weight, designers had to give up another customary Samsung feature – metal base of the slider. Now the inner side of the slider part consists of an accurate even plate colored black. The slider mechanism consists of metal "rails" at the sides of the case. It's hard to say so far which mechanism is more durable, time will show. The E630 keypad is of the standard Samsung configuration, it offers maximum convenience possible at this size. Dimensions, form, press force and stroke of keys are optimal, they are pleasant to use. The only thing we should note – the main keypad is practically flat, the keys are separated by profile elements, but still they are difficult to differentiate by touch. This keypad is designed to work "by sight". The other rigging of the E630 is standard. The left edge houses a volume control rocker switch, the right one contains the Photo button. Both controls are small but quite convenient. A camera lens, a mirror to assist in taking self-photos, and a LED "flash" are located on the back of the base block instead of the usual back of the slider. The right edge houses a jack for audio accessories (hands-free, or Samsung Sound Mate) covered by a plastic slider. The bottom of the phone contains a combined connector for a charger and a data cable. The E630 display is not quite typical for Samsung. It's also a 128x160 TFT display supporting 65 536 colors, but it's smaller. However there is no expected "smoothness" of the image, it looks grainy even to a greater degree than on larger displays of other Samsung phones. Besides, angles of view are noticeably limited in all directions, this effect is more prominent than in other models. But the image remains bright and sharp, the colors are saturated, though maybe a tad less than in the E800, for example. It's quite readable under direct sunlight or without backlight. The phone is equipped with a lithium-ion battery integrated with the cover of the battery bay. The unit is mounted unusually: the teeth are on top, the bottom end is fixed by a tight button-catch located on the bottom of the case. Removing the battery proved more difficult than in other models, but you'll have no serious troubles. The socket for a SIM-card is simple, with a cross metal pressure plate. 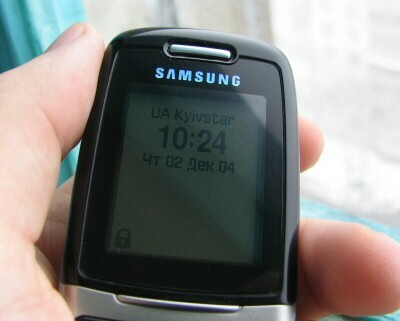 The Samsung SGH-E630 is based on suwong platform, it's practically a complete copy of the E800 in functionality, the difference is only in the design of menu icons and minimal modifications in utilities. The main menu is also a two-dimensional array of icons, context menus are one-dimensional, text. All menu items are numbered, you can quickly navigate the menu with numeric keys. The left soft-key is used as the OK button (traditionally for the "old" Suwong platform), the button in the joystick does not perform this function. The phone is equipped with an advanced addressbook for 1000 records, each one can store 4 phone numbers, fax number, e-mail address, and a note. Besides, each contact in the addressbook can be assigned to a group, picture, and individual ring tone. You can access the addressbook only using the right soft-key, you cannot open the addressbook from the main menu. The addressbook has its own menu in the traditional suwong platform style – two-dimensional, with horizontal scroll of upper level items and with vertical scroll of bottom level items. The phone has no voice dial function. Records from the SIM-card and built-in phone memory are displayed in the same list, the only difference between them is that the functions of the advanced addressbook and even grouping are not available to SIM-card records. 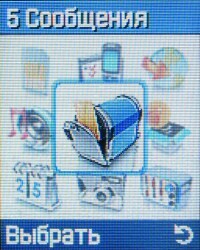 The first option of the main menu is reserved for a SIM-menu if available. If the SIM card does not have this function, this option remains unavailable. The Call Records menu contains a standard set of functions to work with the history of calls and their costs, if such functions are supported by the provider. Via the Network Services menu you can control such functions of GSM networks as diverting, call barring and waiting, etc. The Sound Settings menu allows setting ring tones as well as sounds for practically all events of the phone – slide tone, power on/off, connection tones, etc, to say nothing of message tones. Vibra alert is also controlled from the Sound settings menu. 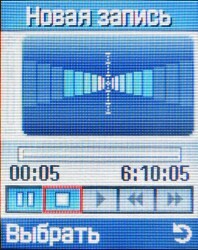 Signals of the alarm clock, organiser, and individual ring tones are specified separately, in other menus. 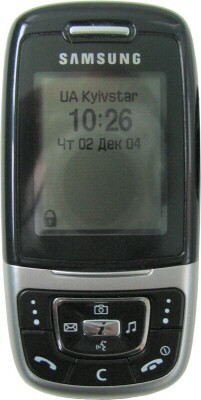 Note that the phone is equipped with a 64-chord synthesizer, you can upload melodies from a computer or via WAP. The phone does not provide such alert type as simultaneous vibra and a ring tone. This is typical of Samsung phones. 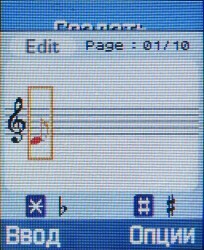 Users are offered melodies with vibra operating as an instrument instead, controlled by one of the tracks of SMAF-polyphony. The next menu item is Messages. The phone supports MMS, including multi-page ones. 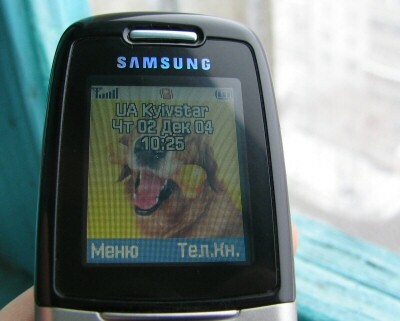 You can type cyrillic letters in MMS, SMS and text data in phone memory. Voice mail is accessed via the Messages menu as well. The Fun box menu contains a set of "entertainments" – traditionally for Samsung it comprises a WAP-browser Openwave supporting WAP 2.0 and programs for browsing photos, images, and sounds stored in phone memory. The next item – Java world – allows to run Java-midlets and control them. The preinstalled games include SnowBallFight (arcade game of snow balls with a tournament system and buying additional equipment) and Bubble Smile (puzzle). The new model has a new feature – melody composer. Melody composer allows you to compose a monophonic tune by notes (it's displayed in a usual form on a stave) and to select an instrument to play this tune. The Organiser menu comprises business utilities. 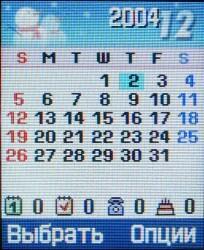 The calendar has only a monthly view, it features a convenient indicator of the total number of active events – they are displayed right under the array of dates as numbers near the four icons of main event types. Unfortunately, the organiser memory is limited to 25 events of each type, which may be not enough in total or in their distribution. Then goes a to-do-list, a world time clock, and an alarm clock. The latter allows to program three different recurrent alarms, for each alarm you can set the time and select days of the week when the alarm is active. You can set a one-time alarm if you want. This should be a sufficient set for most people. The list of business utilities also includes a calculator, a powerful converter of various units (currency, length, weight, volume, area, temperature), a timer, and a stopwatch. The E630 does not just have a voice recorder (some models on the suwong platform have it, some don't), but its functionality is considerably expanded. You can now record sounds of any duration, limited only by the capacity of the free memory, maximum length may exceed 6 hours. You can also record phone calls, the voice recorder can be started from the context menu even when the phone call is already in progress. The user interface of this applet has been naturally changed. Built-in camera allows to take photos of 128x120, 128x160, 320x240 and 640x480 pixels. It can be called from the Camera menu, or by pressing the joystick up, or using a special button on the right side of the case. You can select one of 4 JPEG compression levels, from Economy to Super Fine. The camera possesses rich settings. There are several shooting modes – normal shot, multi-shot, night mode. A frame can be automatically added to a photo. You can apply several effects to a photo – Gray, Negative, Sepia, Emboss, or Sketch. You can also rotate photos, mirror them, or shoot with a timer. Hot keys are used for a fast access to the most popular options – the side scroller controls image rotation, horizontal directions of a joystick control image brightness, vertical – digital zoom. Shooting quality is typical of VGA cameras. And finally, the Settings menu contains standard phone options. The Samsung SGH-E630 contains a tad less than 20 MB of memory. It's quite a large volume for our time, especially for an image model. The Samsung SGH-E630 holds true to all reception quality, speech quality, and ring tone reviews we made of other models based on Suwong platform. In three words – everything is OK. 64-chord polyphony is quite melodious, though it's a tad quiet, the vibra alert is noticeable. Battery life is up to 4 days, which is not bad for this compact model. Note that Samsung phones have recently started to resolve the problem of insufficient battery life, it's mostly connected with the usage of new lithium-polymeric batteries. We have mixed impressions of testing this phone. We liked the phone visually and functionally: it's small, nice looking, and neat. Features of the Suwong platform are more than enough for an image product, its software is convenient to use and sufficient for an average user. Especially we want to note an excellent voice recorder, which is not always implemented in Samsung phones. These advantages are counterbalanced by disadvantages – bad ergonomics of the slider and relatively weak display. Both things are unexpected, as its well known concerning the former that Samsung has always tried to use successful designs (in this case – automatic opening mechanism) and has practically never given them up, until something better is not invented. It's clear that the complex mechanism in this model is sacrificed to the reduction of weight and dimensions. The latter issue is still more confusing: Samsung manufactures ones of the best phone displays and has always used proprietary displays of the latest generation in its models. What we see in the E630 reminds rather of the displays, which Samsung sells to other phone manufacturers (that is of the older design). Probably the usage of this display is dictated by the same miniaturization reasons, but the display is obviously worse than TFT displays in other Samsung phones. The situation can be logically explained only in one case – if the E630 is the cheapest slider in the series, its price difference from the next model being not less than $50-70. But its current price is only slightly lower than that of the E800 so far. So for now the E630 is only a niche solution for those who need a maximally compact slider. There are already several such models announced, and the new phone from Samsung will obviously have to compete with them. The E630 looks great here, being a high quality and functional product from a recognized manufacturer. On the other hand, its price is high. At a tad higher price you can buy the E800, for example, which is devoid of drawbacks of the E630. Note that the ideology of the E630 resembles such model as Siemens SL55. At least the Samsung product clearly demonstrates the same compromise between the hardware features and the strict limitation of weight and dimensions. It's practically time that the SL55 should be completely out of date. And the fleet of these phones is rather large – it used to be actively bought by women because of its compact dimensions and original design. Will the Samsung SGH-E630 be its replacement?